The Asombro Institute can bring a bit of hands-on science and the desert to your classroom. All programs provide an opportunity for students to learn about science through hands-on activities. Each program is aligned with the New Mexico STEM Ready! science standards (including the Next Generation Science Standards) and Common Core mathematics and English Language Art standards, where appropriate. Please call the Asombro Institute office (575-524-3334) to schedule your classroom presentations. Asombro provides programming in all four science disciplines in the NGSS curriculum: life science; physical science; earth & space science; and engineering, technology, & applications of science. Please scroll down to see our specific program offerings. A brief description of the program and applicable science standards are listed for each lesson. Click the science standard to read more on the Next Generation Science Standards website. 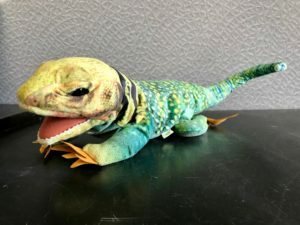 Students will learn that the sun warms the Earth’s surface by conducting a scientific investigation and designing a model to find the ideal place for a lizard to warm up or cool down in their schoolyard. Using their sense of touch, students will investigate different surfaces of the Earth in the sun and shade to determine which are warm or cool. Students will then design a model home for a lizard. K-PS3-1 Make observations to determine the effect of sunlight on Earth’s surface. K-PS3-2 Use tools and materials provided to design and build a structure that will reduce the warming effect of sunlight on Earth’s surface. Click here for a standards sheet with both science and common core standards.